It was the first time in a long time that a librarian so excitedly pressed a book into my hands and promised me I wouldn’t regret reading it. I was amused yet skeptical, and the author being Sudanese didn’t really heighten my hopes since no one since Tayib Salih, in my opinion, has written something of originality and substance. Yet I do not exaggerate when I say from the very first to last page I was utterly enthralled. From story, setting, characters, and style Jamal Mahjoub has found and made a place for himself in the genre of mystery. 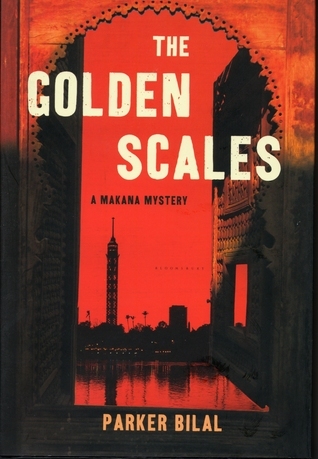 ‘Golden Scales’ is the first novel of the ‘Makana’ series written under the pseudonym Parker Bilal. Our protagonist, Makana, is ever complex, damaged, and in almost every scene glumly smoking a cigarette. We never know the full name of our hero, but it matches the scenario of his backstory; a former Police Inspector in Sudan who had to suddenly flee due to a mysterious past that is revealed gradually throughout the book. I was a bit taken aback by the author’s choice of our hero’s name, because ‘makana’ in colloquial Sudanese is ‘machine’. As I was reading the book I would complain at how absurd and just ill befitting the name was. Thankfully, my father heard me. He tells me, ‘Of course Makana is a name! The Grandfather of our Sheikh of our village was named Makana. It means they are in constant motion, not just in the body, but the mind.’ Which perfectly describes Mr. Mahjoub’s character. Tall and lanky, if Makana isn’t out and about digging for information, his mind is constantly buzzing with a case, his surroundings, and his dark memories. I won’t deny that I was more interested in Makana’s past than the ongoing crime that he was trying to solve as a downgraded private detective dealing with a case of a kidnapping and a deadly rivalry set in the chaotic streets of Cairo where extreme obnoxious wealth rubbed shoulders with extreme back breaking poverty. But that doesn’t lessen my appreciation of Mr. Mahjoubs ability to interweave such two distinct societies seamlessly, where the story isn’t too ‘Egyptian’ or ‘Sudanese’. And what is more exciting is that this will be a seven part series (the second & third in the series, Dog Star Rising, & The Ghost Runner are already out) , where we will witness the Arab Spring and Sudan’s ongoing demise through Makana’s eyes. We finally have a hero who befits our country. He is not flashy, nor awe inspiring. Just an expatriate turned refugee made to feel like a fugitive forever waiting for a chance to return home. And we’re all just trying to get home. Thanks for the recommendation. There are quite a few great Sudanese novelists and story tellers. Two off the top of my head are Abdelaziz Baraka Sakin, and one I came a cross recently is Mirghani Hassan, and his beyond recommended book The General and the Frog (please check the following post – http://wp.me/p30AtW-ob). I have been a follower of el-Tayb Salah and read most of his works. After his death, like many fans, I thought the creative writing holy spirit had left with him, until I read Sakin’s books and most recently Dr. Hassan piece. Many thanks for the recommendations. Will definitely check them out! A long time fan of Jamal Mahjoub’s work, I was unaware that he began writing under a pseudonym. Thanks for the tip Nubian Q. Please read Wings of Dust and In The Hour of Signs also by JM.